The follow up to Mistwalker's Xbox 360 role-playing game Blue Dragon was released in Japan earlier this month for the Nintendo DS to so-so sales. 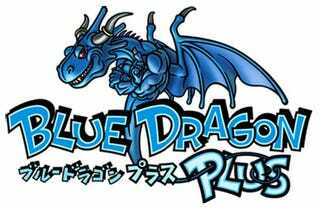 Today, publisher Ignition Entertainment announced that it has picked up the title, hoping for greater success with its release of Blue Dragon Plus in North America and Europe in March of 2009. Wait, the press release actually says the DS title will "breathe fire" across the two continents, a disheartening announcement that spells certain doom. In the short amount of time until we have left we're all burned to a crisp by Blue Dragon Plus' western release, you can enjoy the attached press release, which highlights the creative superteam of Sakaguchi, Toriyama and Uematsu, as well as "exciting RPG elements" like "item collection" and "character progression." What, no mention of menu navigation? Ignition Entertainment Acquires Exclusive Video Game Publishing Rights to Blue Dragon Plus for Nintendo DS™ Property Slated to Release Across North America and Europe in March, 2009 Glendale, CA – September 16, 2008 – Ignition Entertainment Ltd., a UTV Enterprise, a worldwide publisher and developer of videogames, in conjunction with AQ Interactive invite gamers around the world to "Awaken the Power Within" when Blue Dragon Plus for Nintendo DS™ breathes fire across North America and Europe in March 2009. Directed by Hironobu Sakaguchi, Blue Dragon Plus features character designs by Akira Toriyama, and a soundtrack by Nobuo Uematsu. Currently a top-rated show on Cartoon Network in the U.S., the story of Blue Dragon centers on a young boy named Shu and several of his friends who possess the ability to control phantom shadows that mirror the actions of their masters. In Blue Dragon Plus, one year has passed since Shu and his companions defeated the tyrannical remnant of the Ancients, Nene. In the midst of the battle, the world split in two and now consists of a myriad of "cubes" that exploded from its depths. King Jibral notices a mysterious cube in the distance suddenly start to move violently, and from it he sees the Shadow of a Balaur, a three-headed dragon, emerge. The enormous and sinister Shadow is just the beginning of the new turmoil and devastation to come. "We are thrilled to be able to take Blue Dragon Plus to market," said Ajay Chadha, President of Ignition Entertainment. "Out-of-the-box thinking and effective marketing are the cornerstones of our success, and this acquisition relays our standing commitment to that. Clearly our partners have as much faith in Ignition as we have in their products!" "Ignition Entertainment has proven to be an excellent partner for us and we look forward to working together with them again with the launch of Blue Dragon Plus in North America and Europe next year," said Tomoyuki Takechi, CEO of AQ Interactive Inc. Blue Dragon Plus Features Include: • Single Player Campaign With Over 30 Hours of Game Play • Legion vs. Legion o Control up to 16 humans and Mecha Robos to fight against a horde of enemies o Equip your units with items and alter their composition to bolster their strength • Exciting Real-Time Battles and Shadow Fights! • High Quality Dual Screen FMV's Showcasing More Than an Hour of Story Events! • Exciting RPG Elements Such As Item Collection, Character Progression and Robot Customizations ABOUT IGNITION ENTERTAINMENT LTD: Ignition Entertainment Limited is a UTV Media Communication company. Ignition was created by a core team of gaming industry veterans with the purpose of building upon their successful track record to develop and publish within the international games industry. You can find more information about Ignition Entertainment Ltd. At www.ignitionusa.com ABOUT UTV SOFTWARE COMMUNICATIONS LTD: UTV Software Communications Ltd. is India's foremost Media & Entertainment Company with leadership position in four Verticals that includes Motion Pictures, Broadcasting, TV Content and Interactive (i.e. Animation and Gaming). Listed on the Mumbai Stock Exchange with the Motion Pictures business listed on the AIM, London Stock Exchange. Walt Disney Inc. holds a strategic stake in UTV. It has subsidiaries with offices across India, the UK and USA. More information on the group is available at www.utvnet.com ABOUT AQ INTERACTIVE: AQ Interactive consists of the main development company, three development studios - ARTOON CO., LTD., cavia inc., and feelplus Inc. (all are consolidated subsidiaries) - and a US-based marketing services agency, XSEED JKS, Inc. AQI is involved mainly in the planning, development, and sales of videogame software. Since its inception in 2000, the group's main objective has been to offer high-quality entertainment products to our users. The group mainly sells videogame software created by their three subsidiaries domestically in Japan , as well as sell licenses for the same software overseas. AQ Interactive also acquires distribution rights for videogame titles created overseas to sell them in Japan . The three subsidiaries each have distinctive development studios and create videogame titles for the company. For more information, please visit: http://www.aqi.co.jp/en/index.html .